Anaheim boasted a thriving wine industry in the late 1800s, before an unnamed affliction killed 40,000 acres of the grapevines and put 50 wineries out of business. The problem was later found to have been Pierce’s disease of grapevines. Would Anaheim be wine country today if it weren’t for Pierce’s disease? Probably not, but the sad fate of this Southern California wine industry underscores the importance of controlling the disease and the insects that spread it in California’s thriving grape growing regions. The bacterium that causes Pierce’s disease has always existed in California, affecting a wide variety of plants, from oleanders to almonds. But the problem shot to prominence in the 1990s with the inadvertent introduction into California of the glassy-winged sharpshooter. The insect is native to the southeastern United States and was most likely brought into California accidentally as egg masses in ornamental or agricultural plant foliage. GWSS has turned out to be a very efficient vector of Xyella fastidiosa, the bacterium that causes Pierce’s disease in grapes. When GWSS made their way to places where scientists believed the bacterium didn’t exist, such as Kern County, grapevines began to express symptoms of the disease. The county agricultural commissioners in the San Joaquin Valley have been working tirelessly over the last 10 years to keep glassy-winged sharpshooters out of grape growing regions to protect a very valuable economic driver. In Fresno County alone, where grapes are the No. 1 agricultural commodity, the crop was worth $961 million in 2011. Despite the efforts to contain GWSS in Fresno County, the pest is spreading very gradually south and east of the Fresno-Clovis metropolitan area into commercial vineyards and orchards. “Cooperation by urban residents where we find GWSS has been great,” said Fred Rinder of the Fresno County Agricultural Commissioner’s office. Nevertheless, in 2012, GWSS was found spreading out in Kerman, Parlier, Sanger and Kingsburg. Stephen Vasquez, UC Cooperative Extension advisor in Fresno County, fears local grape farmers have become complacent about glassy-winged sharpshooter and Pierce’s disease, even though all grapes are susceptible. The best way to control its spread, he said, is to monitor and manage sharpshooter vectors and remove and replace vines that have tested positive for Xylella fastidiosa. 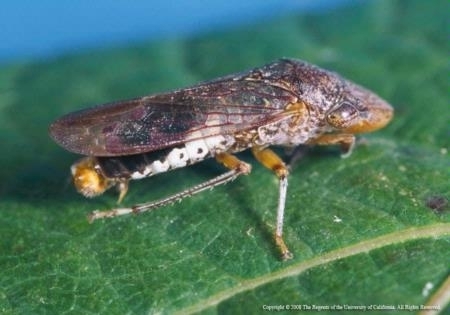 The UC IPM website has extension information on glassy-winged sharpshooter and Pierce’s disease.